Despite a report this week pointing to decreasing federal deficits over the next two years, the longer-term outlook for tax rates grew murkier. 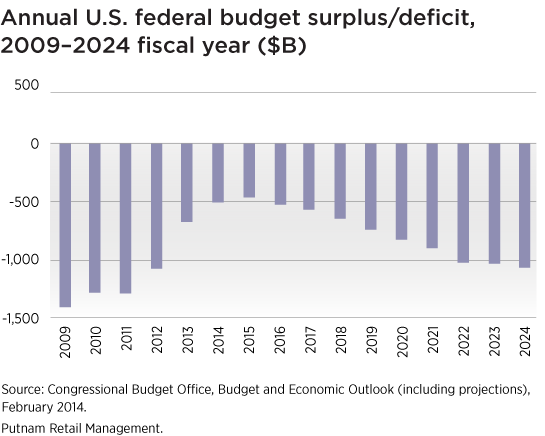 After four consecutive years of topping $1 trillion, the U.S. federal deficit fell to $680 billion, or 4.1% of GDP, in 2013, according to the Congressional Budget Office (CBO) Budget and Economic Outlook: 2014 to 2024. This downward trajectory, is projected to continue for a couple of years before reversing direction and increasing again in 2016, the CBO predicted. While federal tax revenue as a percentage of GDP is expected to increase to 18.1% from 17.5% over the next 10 years, spending is estimated to increase twice as much over the same time period, the report noted. Rapidly increasing spending for programs such as Medicare and Social Security as more baby boomers retire. For example, Social Security spending, which is currently 4.9% of GDP, is projected to grow to 5.6% of GDP by the end of 2024, and Medicare will increase from 3.5% to 4.1% for the same period. Unemployment will decline, but the CBO predicts it will remain above 6.0% until 2017. Also, the labor force participation rate is projected to decline further as improvements in the economy will be offset by demographic trends, especially among aging baby boomers. Rising interest rates will increase borrowing costs. The net interest on existing public debt is projected to increase to 3.3% of GDP in 2024 from 1.3% of GDP in 2014, translating into $880 billion by 2024 from $233 billion today. Rising health-care costs including federal subsidies associated with the Affordable Care Act. How does the debt outlook affect clients? The CBO makes it clear that its outlook is a projection, based on current policy. It would be impossible to take into account potential future legislation that could influence taxes or entitlement reform. Still, taxpayers will want to pay attention to the trends outlined in the report and the likelihood that the federal government might seek ways to increase revenue, including the potential for higher taxes. Given the unsustainable, long-term growth of mandatory spending programs, higher income clients need to plan for the likelihood of benefit decreases as well as tax increases. The federal government has a range of tools — including raising taxes on Social Security benefits, increasing the Social Security wage base, raising certain Medicare premiums, reducing tax preference items such as charitable deductions, or implementing new taxes on the affluent. Having a conversation today with your clients can help identify planning and savings options to hedge some of these potential risks in the future.